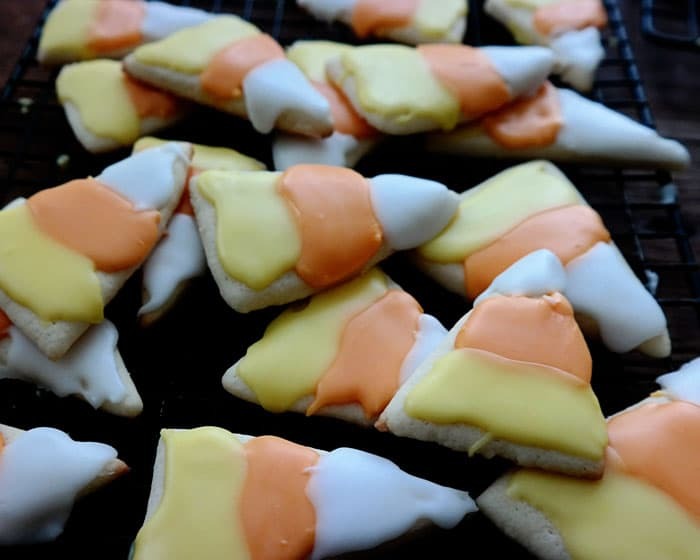 Candy Corn Iced Sugar Cookies - Chocolate Chocolate and More! 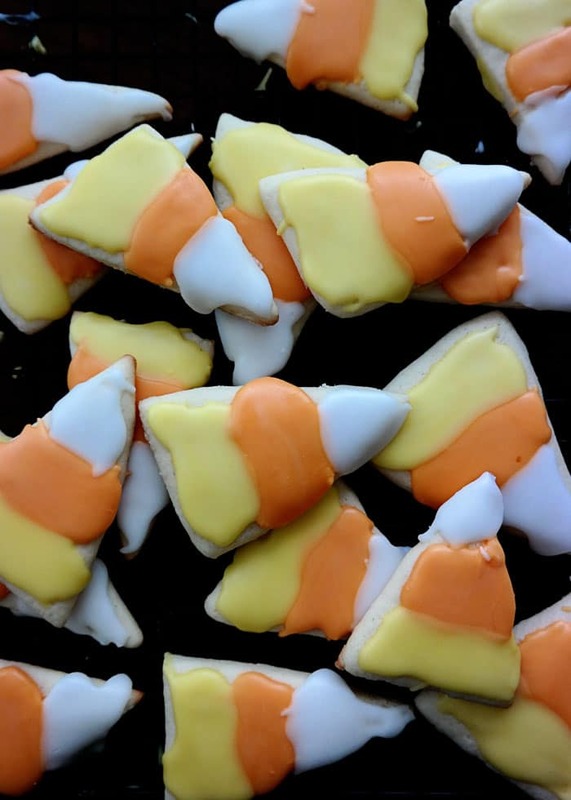 Create these easy Halloween cookies using this Candy Corn Iced Sugar Cookies recipe. Perfect for any holiday and with my easy tips, everyone will have fun making and decorating them! I love this time of year. It’s finally cool enough to bake and it’s one holiday after the other. All of them a great excuse to make sweet treats. Costumes, decorating, candy and other fun treats. Everyone gets to feel like a kid at Halloween. It’s also, usually, the first class party at schools. These Iced Sugar Cookies can be made ahead of time as a treat for the kids or they can be decorated as party of a party. The best cookies always start with Butter and Dixie Crystal Sugar. When a cookie only has five ingredients, you want to make sure you are using quality ingredients. You want real butter, not margarine. Butter and margarine have different melting temperatures which will affect the texture of your cookie. Also, there is no flavoring in these cookies so you want that “real butter” taste. 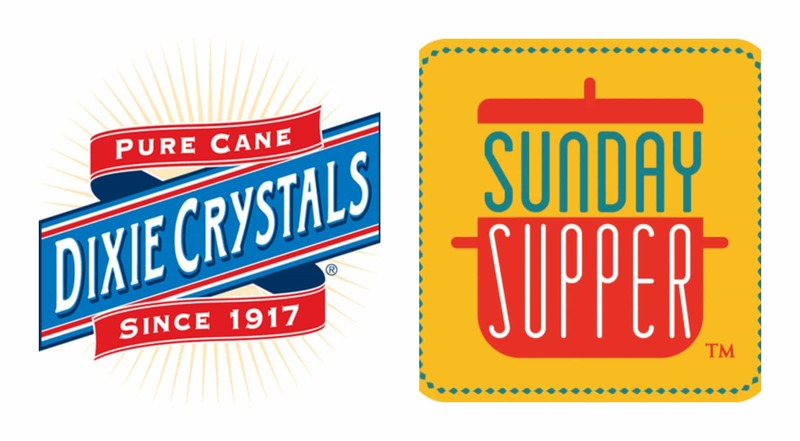 Use a good sugar like Dixie Crystals Pure Cane Sugar. Non-GMO and always provides consistent results. I used to consider making cut-out cookies a chore. Making the dough. Chilling the dough. Using cookie cutters to cut out shapes, then rerolling the scraps. Somewhere along the way, I developed easy shortcuts to make it easier. Next time you go to the Chinese restaurant, ask for extra chopsticks. 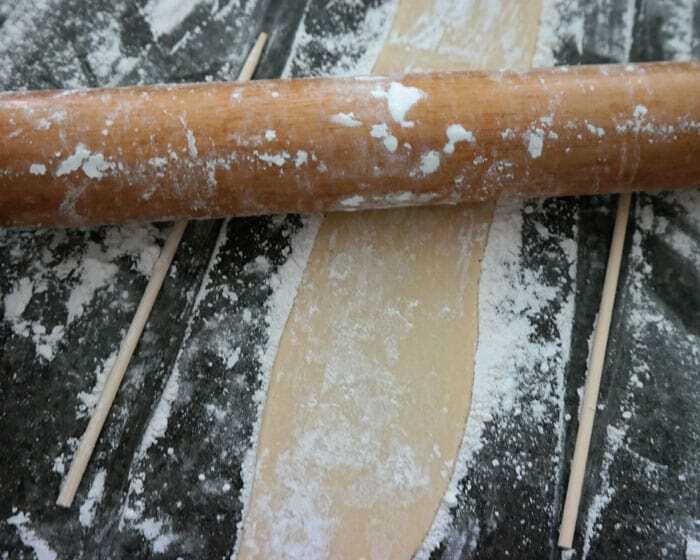 Placing them on either side of your dough while rolling it out will give you an even thickness. Choose shapes that don’t require a second roll. Shapes with straight lines like triangles and squares. I love using my bench scraper for cutting cookie dough. And it’s great when kids are doing it. No sharp knife edges to worry about with tiny hands. 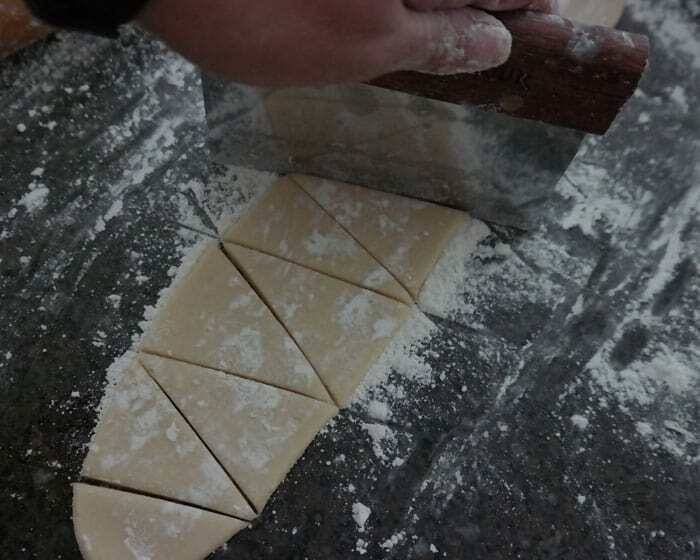 The Bench Scraper also works as a lifter for transferring cookies to your baking sheet. I prefer easy for my decorating too. Starting with a simple glaze icing, the pure white of Dixie Crystals Powdered Sugar lets the true color of food coloring come through. Choosing a simple design like Candy Corn, means no special tools required. Just a spoon, some toothpicks and a little mess. (but isn’t the mess half the fun of it?) Spoon the icing onto your cookie, then use a toothpick to spread the icing to the area you want. Don’t worry if the icing isn’t smooth, as the cookie sets, the icing will settle and create a nice shiny top. Easy to bake, easy to decorate and even easier to eat! Connect with Chocolate, Chocolate and More! Cream butter and sugar together until creamy. Add in egg and beat again. Combine flour and baking powder and slowly add to butter mixture until combined. Divide dough in thirds. 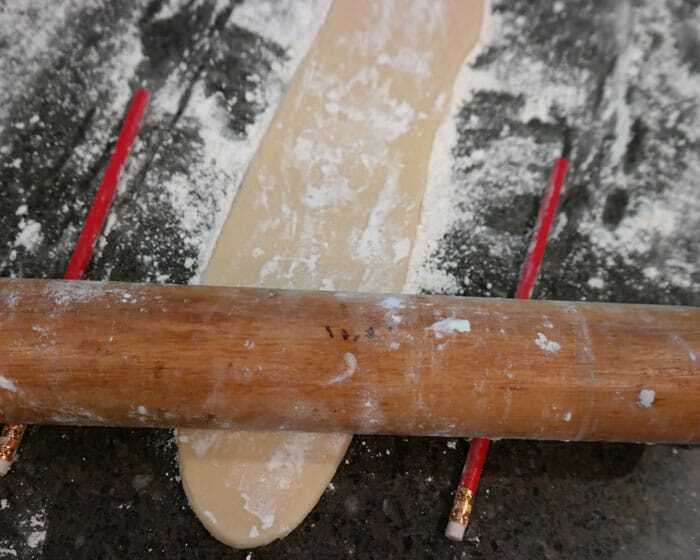 Roll out each third of dough on floured surface to 3/8 to 1/4-inch thickness. Cut into desired shapes. 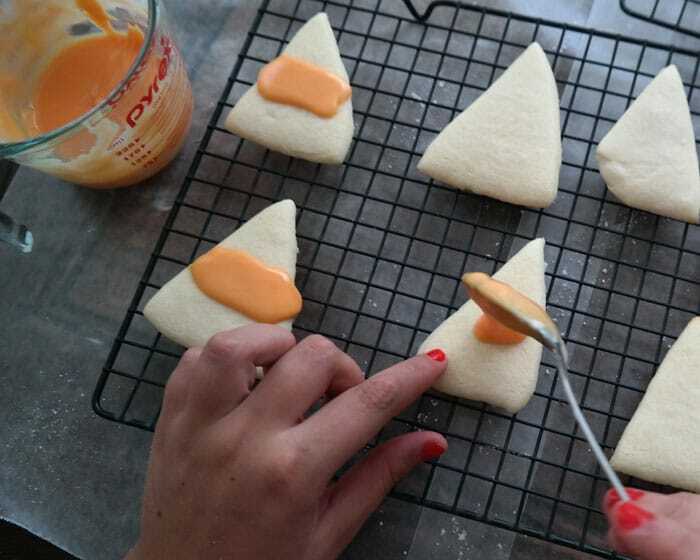 For candy corn cookies, roll dough out to 3-inch wide strip, then use a sharp knife or bench scraper to cut into triangles. Place cookies on an ungreased baking sheet. bake in a preheated 400 degree oven for 6-10 minutes. Remove cookies to cooling racks to cool completely before icing. Combine powdered sugar and 4 Tablespoons water until smooth, add more water if needed to create a thick icing. 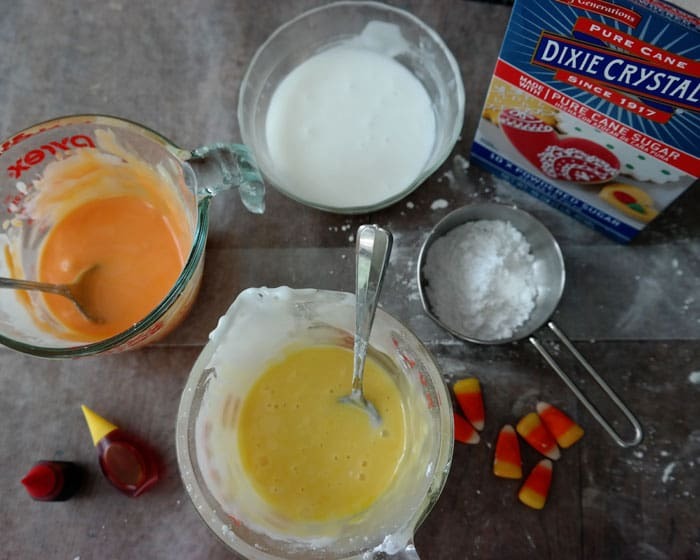 Divide icing in thirds, leaving one-third white and adding food coloring to other 2 thirds to create a yellow and orange icing. Using about 1/4 teaspoon of orange icing, spread across middle of cooled cookie. repeat with white (at top of cookie) and yellow (across bottom of cookie) icings. Let cookies set for 4 hours before storing. for a faster set of iced cookies. Place cookies on cooling rack, then place cooling rack on baking sheet. Place baking sheet in cold oven with just the oven light turned on for 1 hour. You know, these triangles would look good as Christmas trees too. This post is sponsored by Dixie Crystals in conjunction with a social media campaign through Sunday Supper LLC. All opinions are my own. As always, I only share products I truly love. Welcome to Sunday Supper! Glad to see you in the lineup. I’d rather have your cookies than candy corn any time. Finally! I can be a fan of candy corn!! These look yummy! Now THIS is candy corn I will eat! Such cute cookies and great tips! Thanks for sharing! I especially love the chopstick idea! Genius!! Your cookies look adorable. I bet kids would love decorating them. Too cute! My kids would love these for Halloween. I wish that you were still here for me to talk to. 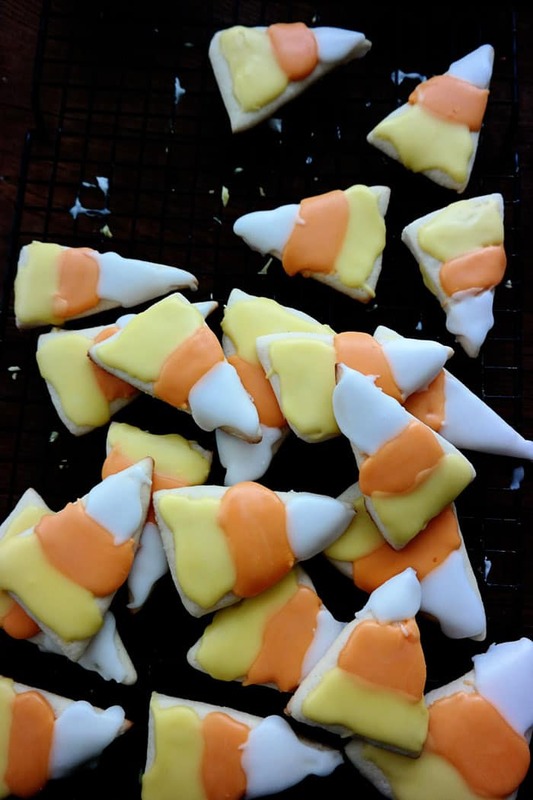 I’d tell you that these are by far the best candy corn cookies ever and how much I love them. I’d tell you that these are probably the only way I’m going to eat candy corn and that I was going to make them for our Halloween dinner (and I still am). I wish I had taken the time to come over to the blog on Sunday when these went live with our Sunday Supper recipes so that you could have see this. I miss you already. These are adorable! Perfect for Halloween party!